(CAMBRIDGE, Massachusetts) — To make robots more cooperative and have them perform tasks in close proximity to humans, they must be softer and safer. 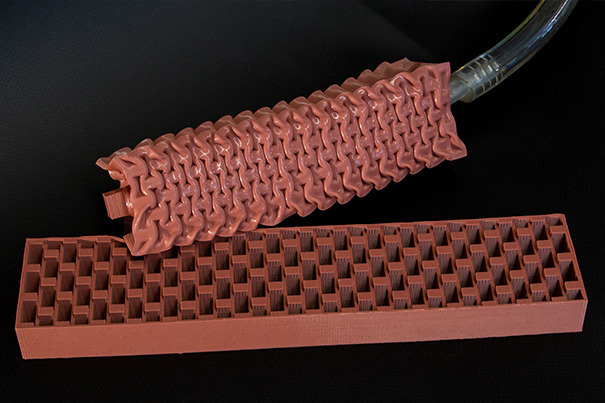 A new actuator developed by a team led by George Whitesides, Ph.D. — who is a Core Faculty member at Harvard’s Wyss Institute for Biologically Inspired Engineering and the Woodford L. and Ann A. Flowers University Professor of Chemistry and Chemical Biology in Harvard University’s Faculty of Arts and Sciences (FAS) – generates movements similar to those of skeletal muscles using vacuum power to automate soft, rubber beams. Harvard’s Office of Technology Development has filed patents on this and related inventions, and the soft actuator technology has been licensed to Soft Robotics, Inc., a startup launched in 2013 and cofounded by Whitesides. The company is developing robotic grasping systems toward initial applications including picking and packing in unstructured environments — for example, handling fruits and vegetables in produce distribution warehouses. Longer term, this technology can be leveraged to develop products for biomedical applications. Harvard University Faculty Arts and Sciences (FAS), (http://www.fas.harvard.edu/) founded in 1890, is the largest division of Harvard University. The Faculty of Arts and Sciences is dedicated to being at the forefront of teaching and learning and fostering cutting edge research and discovery. FAS is redefining liberal arts education for the 21st century and is committed to an open Harvard and student aid by making a Harvard education accessible to students from all backgrounds. FAS comprises Harvard College and the Graduate School of Arts and Sciences, including undergraduate and graduate admissions; the School of Engineering and Applied Sciences; and the Division of Continuing Education, including the Extension and Summer Schools. FAS also encompasses academic resources, such as libraries and museums, as well as campus resources and athletics.